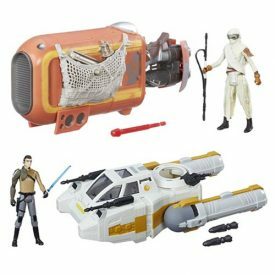 Entertainment Earth has the Y-wing Scout Bomber (with Kanan Jarus) and Rey’s Speeder (with Rey) set for $20 as a Daily Deal Special. ← Don't Miss Out On All Of The Dirt Cheap Merchandise At HTS! Hasbro also re-released the Y-wing Scout Bomber in the Rogue One toy line. Let’s check it out in our Research Droids Reviews today! Be sure to leave your thoughts in our comments section, vote in the poll or even comment about it on our Facebook page. Click the banner below for the direct link to the review! As always, you can also send your review requests via email if you’d like to see something that we didn’t cover yet.